This book is written for athletes and those who want to look and feel like an athlete. It will give you the tools you need to strip fat off your body and improve sport or life performance. Part 1 of this book will teach you how to train for athletic fat loss. Part 2 will show how to design your own personalized meal plan. Part 3 will show you how to effectively monitor your body composition and adjust your lifestyle to accelerate your results. Part 4 will give you complete training programs for beginners, intermediates, and advanced trainees. See purchasing options below or click HERE for more information. 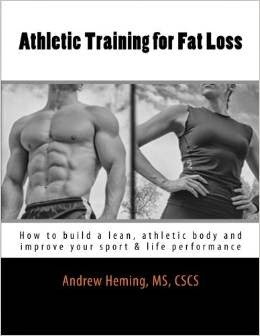 Buy Athletic Training for Fat Loss ebook now! To purchase this book as a paperback on Amazon, click HERE. I offer both monthly (1 or 3-month options) online coaching and as well live sessions with appear.in. See my online coaching page for more details. Are you sick of all those cookie-cutter training programs out there? Do you want a truly personalized program based on your needs, goals, body type, personality, experience and equipment availability? If so, you have come to the right place. This is the perfect option for those not interested in on-going online or in-person coaching. Start by emailing me Andrew.Heming@twu.ca and tell me a little about yourself and your training goals. This lets me make sure that we will be good fit. I will email you back with the details I need from you to create a personalized training program. Then you can click this button and I'll go to work on creating your program. Your custom program will be emailed to you with instuctions on how to read the program and details for all your training variables. In addition, every exercise in your program is hyperlinked to one of my YouTube videos to show you exactly how to do it. If you live near the Langley area, you can come and train with me in person. For serious inquiries, contact me at Andrew.Heming@twu.ca. If you are not local, check out my Online Coaching Services. If you are interested in having me present a course or workshop for your business or organization or having me speak at your conference, please email me at: Andrew.Heming@twu.ca.